Fujitsu Laboratories Ltd. today announced that it has successfully developed a cathode material for lithium iron phosphate rechargeable batteries. This new material offers high voltage that could only be achieved by cobalt-based materials in the past. Currently, the rare metal cobalt is a component of cathodes in high capacity and high-voltage lithium rechargeable batteries for electric vehicles (EVs) and home storage batteries. As these devices become more popular, there are concerns regarding future shortages of cobalt used in rechargeable lithium-ion batteries. Significant cost increases are also expected, generating interest in abundant and cheap iron to replace cobalt as the constituent element in rechargeable batteries. However, iron could not offer voltage comparable to that of cobalt-based materials. Now Fujitsu Laboratories has discovered a new factor that can improve the voltage of iron-based materials. Using a proprietary materials design technology as well as a technology that precisely controls the composition of raw materials and the formation process of materials, Fujitsu Laboratories has successfully synthesized lithium iron pyrophosphate (Li5.33Fe5.33(P2O7)4). 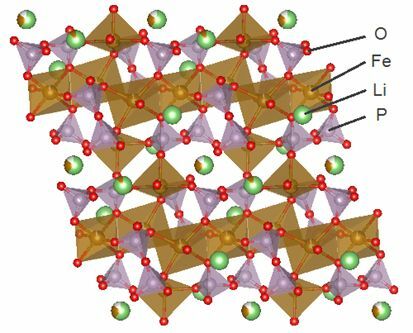 This phosphate-based material has a voltage of 3.8 V, comparable to that of existing cobalt-based materials. In the future, Fujitsu Laboratories will seek to improve the performance of cathodes using this newly developed iron-based material. By advancing the design of new crystal structures that can maintain a high voltage state for longer periods, Fujitsu Laboratories aims to develop cathode materials that offer high energy density comparable to cobalt-based materials. In this way, Fujitsu Laboratories will contribute to lowering the cost of lithium rechargeable batteries and the devices that use them. Details are being announced at the 231st ECS Meeting, an international conference on electrochemistry, currently underway in New Orleans, U.S., from May 28 to June 1. Currently, lithium-ion batteries are widely used as high-performance rechargeable batteries. However, there are concerns about insufficient supply and rising costs, as the batteries' cathode materials contain the rare metal cobalt, such as lithium cobalt oxide (LiCoO2). Large volumes of lithium-ion batteries will be required in the future for electric vehicles in order to achieve a low-carbon society that does not rely on fossil fuels and emit greenhouse gasses in the age of global warming. Consequently there has been a great deal of interest in developing materials that use iron, which is abundant on earth, as a constituent element in place of cobalt. Previously, there was a problem with lithium-ion batteries using iron-based materials as they could not reach the energy density of those using cobalt-based materials. Energy density is expressed as a product of capacity density and voltage. Accordingly, iron-based materials with voltage of 2.8 V to 3.5 V could not compete with cobalt-based materials whose voltage ranged from 3.75 V to 4.1 V. It is known that the voltage of cathode materials can change depending on the arrangement of atoms in the crystal structure, which created issues in the development of new iron-based materials with high voltage. Now, by analyzing the correlation between the crystal structure of iron-based materials and their electrochemical characteristics, Fujitsu Laboratories has discovered new factors in improving the voltage of iron-based materials. Using a proprietary materials design technology and a technology that precisely controls the composition of raw materials and the formation process of materials, the corporation has successfully synthesized lithium iron pyrophosphate (Li5.33Fe5.33(P2O7)4). This phosphate-based material has a voltage of 3.8 V, comparable to that of existing cobalt-based materials. The voltage of cathode materials is significantly influenced by the coordination of elements such as iron and oxygen in the crystal. By analyzing the interrelationship between the crystal structure of a material and its electrochemical characteristics, Fujitsu Laboratories discovered new factors in improving the voltage of iron-based cathode materials. In fact, it was discovered that a distorted arrangement of oxygen atoms around iron atoms is one of critical factors for the high voltage. 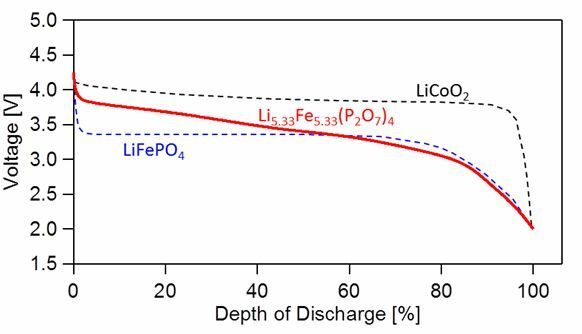 Using a proprietary Fujitsu Laboratories technology that precisely controls the coordination of raw materials and the formation of the material, Fujitsu Laboratories succeeded in synthesizing lithium iron pyrophosphate (Li5.33Fe5.33(P2O7)4), a new iron phosphate-based material (Figure 1). 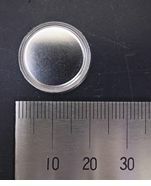 Fujitsu Laboratories created a coin-shaped prototype battery (Figure 2) and based on the results of its electrochemical properties evaluation, it was confirmed that it could achieve a voltage of 3.8 V, comparable to that of existing cobalt-based materials. This material has an even higher voltage than previously developed iron phosphate-based materials, represented by lithium iron phosphate (LiFePO4) (Figure 3). The charge capacity of the prototype coin battery is about 105 mAh/g(1) , which accounts for approximately 75% of the theoretical value of 139 mAh/g (Li5.33Fe5.33(P2O7)4), or the actual value of 137 mAh/g (LiCoO2). Through continued analysis, Fujitsu Laboratories plans to further improve such figures. The newly-developed cathode material has not reached a voltage equal to existing cobalt-based materials in terms of energy density. Nonetheless, it has paved the way to increase the voltage of iron-based materials, resolving a roadblock in the research development. In addition, cobalt-based cathode materials are used in lithium-ion batteries for electric vehicles as well as devices such as smartphones and digital cameras. If a cathode material is developed with the same energy density as cobalt-based materials, this will enable the stable production of cathode materials by replacing the rare metal cobalt with abundant iron. Moreover, this is expected to contribute to the stable production of lithium-ion batteries and the devices which use them, such as electric vehicles. Based on this cathode development, Fujitsu Laboratories will work to design a crystal structure that can maintain a voltage on par with cobalt-based materials for longer periods. The electrode can also be used as a low-cost cathode material in safe, solid-state rechargeable batteries. Fujitsu Laboratories will contribute to a more sustainable and comfortable society by developing next-generation high-energy-density rechargeable batteries that are safer, cheaper and environmentally friendly. An expression of capacity density per one gram of cathode material, this is the electrical current required when it is assumed that it will take one hour for a battery to completely discharge from a fully charged state.